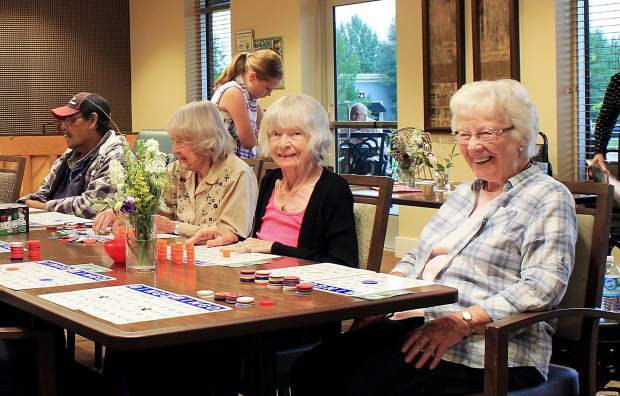 A group of Castle Peak Senior Life and Rehabilitation residents enjoy a round of bingo this week. Visit castlepeak.org, or call 970-989-2500. EAGLE — After years of talking and planning and research, in 2016 Eagle County welcomed its first senior care facility when Castle Peak Senior Life and Rehabilitation opened in Eagle. In the two years since it began operations, the center has become an integrated part of the Eagle Ranch neighborhood and a valued asset to locals, as its occupancy figures demonstrate. According to Castle Peak campus administrator Molly Bischoff, current residency at the center shows that senior care was, indeed, a critical need in the community. Bischoff noted that since opening the memory-care unit earlier this year, Castle Peak has filled 11 of its 12 available spots. Over in the skilled nursing area, eight of the 12 available spots are occupied and the long-term care unit is full, with 22 residents. The assisted living wing currently has 12 residents and 22 available units. This week, the facility hosted a special reception for community members and donors who helped make Castle Peak happen. During the past two years, Bischoff said that Augustana Care, the Minnesota-based company that operates Castle Peak, has refined its operation in response to local demand. Staffing has been a challenge at Castle Peak, Bischoff said. But that is not a challenge that’s unique to the facility, she said, as employers throughout Eagle County struggle to find workers. “Some of our nursing assistants have gone on to nursing school, and that’s a success story for us,” Bischoff said. One constant for the past two years has been the presence of chef Marty Toper. He’s one of the most popular staff members among the Castle Peak residents. For the year ahead, Bischoff said the facility will focus on filling out the assisted-living units and continuing is responsiveness to residents’ desires. “We want them to love the facility,” she said.